Conceptual rendering of what the recommended LPA could look like at the King of Prussia Mall. 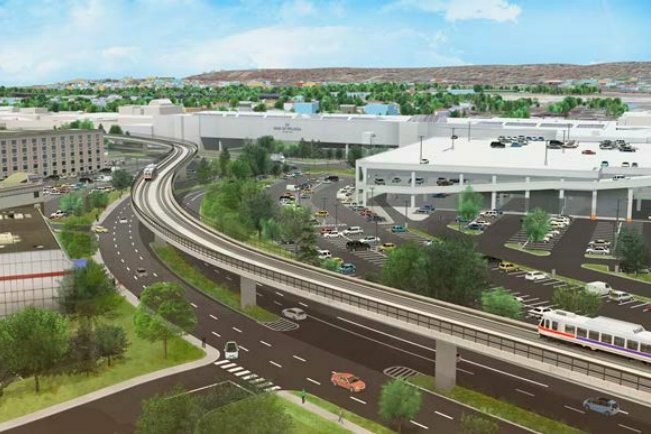 SEPTA's board on Thursday approved a final route for the Norristown High-Speed Line extension that will provide direct service to the King of Prussia Mall. The 4.5-mile, elevated high-speed rail extension would give riders a faster connection among King of Prussia, Center City and University City, the region's three largest economic hubs. It is projected to cost between $1-1.2 billion and will include two stops at the mall among others in the King of Prussia vicinity. The extended coverage is expected to cut the commute between Center City and King of Prussia by about 30 minutes each way. Overall, the extension will have five stops and add about 9,500 trips per day by 2040, SEPTA said in a press release Thursday afternoon. Under the proposal, riders could take the high-speed line to King of Prussia from 69th Street Transportation Center in Upper Darby or the Norristown Transportation Center. SEPTA riders now must take a bus the entire trip or take a connecting bus from the rail line to get to King of Prussia. Drivers typically get to the mall using I-76 and I-476, both of which have heavy traffic during rush hour and other travel times. The SEPTA board chose the "North/South design option, which diverts the tracks to the north side of the Pennsylvania Turnpike and away from the Valley Forge Homes neighborhood. The route then cuts to the south side of the turnpike and away from homes in the Brandywine Village community. An earlier proposal would've had the tracks running within 20 feet of residential backyards, a sticking point that helped spark opposition from the community. In a statement on Thursday, SEPTA Board Chairman Pasquale T. Deon Sr. called the project a "critical initiative in SEPTA’s efforts to connect the region for more integrated mobility, and enhance the area’s economic vitality, sustainability and quality of life." Overall, the transportation authority evaluated more than 30 possible routes for a connection between the Norristown line and popular stops in King of Prussia. SEPTA said it weighed input from the community and other stakeholders. The project is still years away from breaking ground. A final environmental impact statement is expected to be complete in 2019. It could then take another few years to complete a final engineering design and secure funding for the project before construction begins, according to a SEPTA fact sheet for the project.